Every year more pilgrims choose to do the Way to Santiago by bike. This experience will allow you to enjoy the Camino on a different way. You will be able to visit close places to the way thanks to the bike. If you want to read our general advices for doing the Way to Santiago, check our specific page. If you are ready to start the adventure of the Way by bike and you want some advices, keep reading. We always recommend choosing the French Way if it is your first time doing the Way, because it is the easiest one. We also recommend this if you are doing it by bike. However, if you have a previous experience on cycle tourism, you can try with more difficult routes as the Northern Way, the Aragonés Way or the Primitive Way. 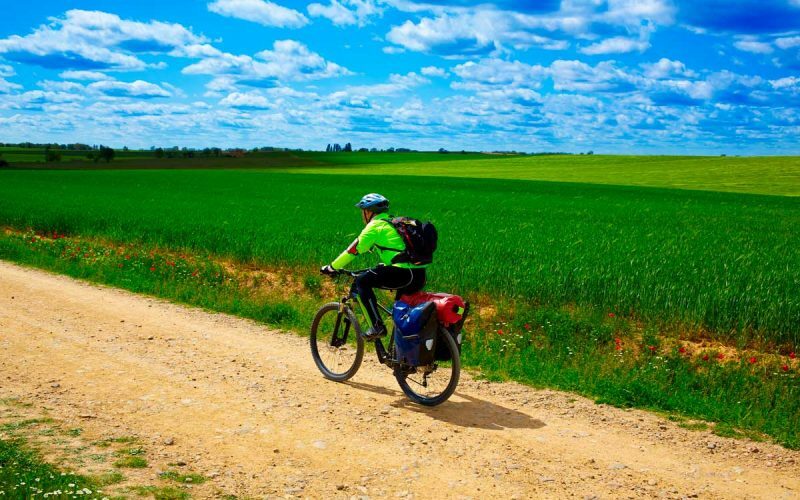 The best time of the year to do the Way to Santiago by bike is during the months of April, May, June and September because the weather is softer. You can also do it during July and August, but you should avoid biking from 12pm to 6pm because it would be so hot. You may pay special attention on dehydration and heat stress. The worst months to do the Way by bike are November, December, January, February and March. In many sections you will find snow and the ways will tend to be blocked. There are two options to do the Way to Santiago by bike: following the same path as if you were doing it walking or using the nearby roads. On the first option, you should use a mountain bike with a good suspension system and and chainwheels. If you choose to do it on the roads, you can use a city bike with dynamo and reflectives stripes. It is important to use a bike as light as possible. It has to have a good changing system, greased and a perfect condition of the tyres. 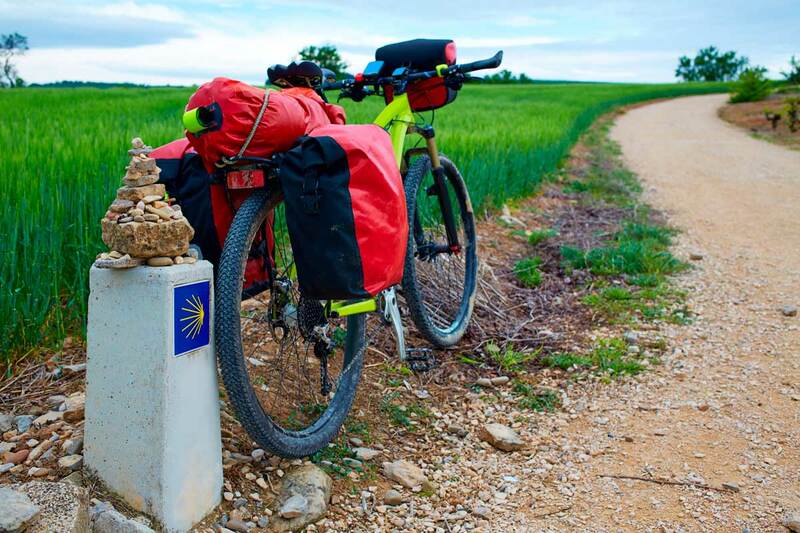 There are a lot of business that will permit you renting a bike to do the Camino, but if you choose to do it with your own, you can use Correos or Seur to transfer it. If you choose to do the Way to Santiago by bike, ideally you should do it in group. If you are in a group you will be able to take turns to enter in some places to visit while other people stay out with the bikes. You can also share tools and knowledgment to repair your bike if necessary. If you want to do the Way to Santiago alone you will find a lot of pilgrims, so you will be able to join them. This will make your experience safer. But take note that, doing the Camino in groups does not mean that you can cycle in squads, you should ride your bikes in line in order to minimize risks. We recommend you training before starting the Way to Santiago. It is important to think in your physical condition in order to plan better your stages. There is no right age to do the Camino, but each one is different. If you physical condition is not good, you should do the Way using the nearby roads and with non heavy bags. It is recommendable to plan shorter stages so you can enjoy the journey. Usually, people do 50 km per day, but no one knows you better than yourself, so define your own boundaries. In order to achieve the Compostela, if you are doing the Way to Santiago by bike, it is necessary to do at least the last 200 kms. It is the double than if you do it walking. You will need to carry the Credencial and have the stamps during your Camino. You can have the Credencial in the beginning hostels or in friends of the Camino associations.